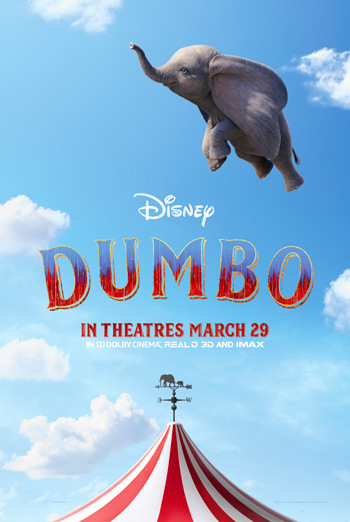 When you purchase your tickets to DUMBO at landmarkcinemas.com you will receive a voucher for one (1) FREE Medium 130 oz. Popcorn! One (1) Free Medium 130 oz. Popcorn voucher will be issued per transaction (not per ticket). The voucher will be included in your ticket receipt. Offer is valid from March 11, 2019 to March 28, 2019, or until 2,000 transactions have been completed, whichever comes first. Voucher valid for redemption until April 30, 2019 at any participating Landmark Cinemas location. To Redeem your Voucher: Please present your voucher to a Cast Member at a Landmark Cinemas’ Concession prior to ordering in exchange for one (1) Medium 130 oz. Popcorn. No substitutions allowed. Additional charges apply for real butter, upsizes, and add-ons. Ticket purchasers will be rewarded with (1) FREE Medium 130 oz. Popcorn per ticket transaction from March 11, 2019 to March 28, 2019, or until 2,000 transactions have been completed, whichever comes first. Voucher valid for redemption until April 30, 2019 at any participating Landmark Cinemas locations. Voucher will appear on the e-mail ticket confirmation page and must be presented (in its original form) prior to ordering. Limited one voucher per transaction. Offer is limited to the first 2,000 transactions. Offer is not available at box office, at automated box office (ABO) or on the ATOM App. Voucher cannot be combined with any other offer and is not redeemable for cash. No substitutions will be available. Lost or stolen vouchers will not be replaced. Additional charges may apply for real butter, upsizes and other additions. One voucher per person, per visit, may be redeemed. While supplies last. No refunds or exchanges allowed. Lost or stolen voucher will not be replaced. No copies or facsimiles will be accepted. Not valid in conjunction with any other discount offer.